Paving the way for national reconciliation and reunification, the north and south Korean football teams played a landmark inter-Korean soccer match in Seoul on September 7. The football match, called "reunification games," ended in a 0-0 draw. Some 60,000 fans packed the Sangam World Cup Stadium in Seoul waving blue and white banners symbolizing a unified Korean Peninsula. Players entered the stadium holding hands with each other as crowds chanted "Jo Guk Tong Il! (Reunify Fatherland!)" Slogans such as "Let us become one and startle the world" and "Whichever team may win, we are one" were seen in every seat in the stadium. South Korean spectators gave a warm welcome to the visiting north Korean national football players, holding banners reading "A unified Korean team is the best in the world" and "We are one." They kept up applause throughout the game for both sides. Both sides mainly fielded players under 23 as they prepared for the 14th Asian Games in Pusan, south Korea, to start at the end of September. North Korea dominated the first half while south Korea had the better of the north in the second half. But the south was unable to cut through north Korea ? defense. Korean residents in Japan also joined the sports exchange between the north and the south in the inter-Korean reconciliation process, organizing a visiting delegation to watch the historic football match. An Yong Hak, a Korean resident in Japan, who is a professional football player belonging to Albirex Niigata of the J-League (Japan's professional football league) Division 2, was selected as a member of the national football squad of north Korea for the inter-Korean football match. The game was sponsored by the Europe-Korea Foundation and supervised by the (south) Korean Football Association. Chong Mong Jun, head of the (south) Korean Football Association, said before kick-off that it would be a historic match which would unite people from the two sides. Ri Gwang Gun, Chairman of the DPRK Football Association, Minister of Foreign Trade, said in a speech at the opening ceremony that the Korean people will show the power of unified Korea to the world, referring to the achievement of the north Korean football team in the 1966 World Cup and of the south Korean football team in the 2002 World Cup. Park Keun Hye, executive of the Europe-Korea Foundation, also said that the activation of inter-Korean sports exchanges would promote peace between both sides and serve an opportunity for the cooperative development of the north and the south. "The north got to the last eight of the 1966 World Cup in England, and the south was among the last four of the 2002 Korea-Japan World Cup. If we get together we can be a powerhouse," Ri Jong Man, coach of the north Korean team, said after the inter-Korean football match. "The football match marked an important occasion for deepening reconciliation and confidence among sportspersons in the north and the south, promoting the unity and reunification of the nation and demonstrating the nation's unshakable will to build a reunified country at an early date under the banner of the June 15 joint declaration," north Korea's official Korean Central News Agency reported. In the past, there were a series of inter-city soccer games in Korea from 1929 which were called "Kyong-Pyong Games" namely, games between Pyongyang and Seoul. But both sides were compelled to stop the games under Japanese colonial rule. After the national liberation in 1945, the games were resumed twice in 1946 and 1990. 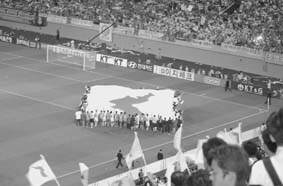 In 1990, an inter-Korean football game named, "the North and South Reunification Soccer Games were held on October 11 and 23 in Pyongyang and Seoul respectively.